It’s not unusual for families and loved ones to bring graduates an armful of flowers or maybe a teddy bear wearing a mortarboard to celebrate their student’s success after they walk across the stage at Commencement. This year, however, new 2019 grads will have the chance to bring home a unique and very UNC Asheville-style graduation gift, thanks to a brand-new Commencement tradition: a tree sapling, grown here on campus and ready to be planted wherever graduates put down their roots next. “Sustainability within a community or within a campus depends on a network of mutual support,” said Sonia Marcus, director of sustainability at UNC Asheville. “None of us would be where we are today — as students, as faculty members, as university staff — had we not benefitted from the support and mentorship of so many other individuals. Julian Johnson collects saplings from campus. In that spirit, the donations from the purchase of the saplings will go to fund student scholarships through the Pisgah Scholars Program, helping new UNC Asheville students thrive and grow, while providing graduates with a living link to their alma mater. It’s the kind of Commencement gift that won’t wilt or end up collecting dust on the shelf—it’s a gift that is not only meaningful to the recipient, but to the planet, Johnson says. Environmental sustainability is a closely held value at UNC Asheville, with numerous student-led projects from the Student Environmental Center, thriving campus gardens, regular certifications as both a Bee Campus USA and a Tree Campus USA, robust composting and recycling programs across campus, the annual Farm to Table Dinner on the Quad, and the ever-popular UNC Asheville Bee Hotel, among many other programs. 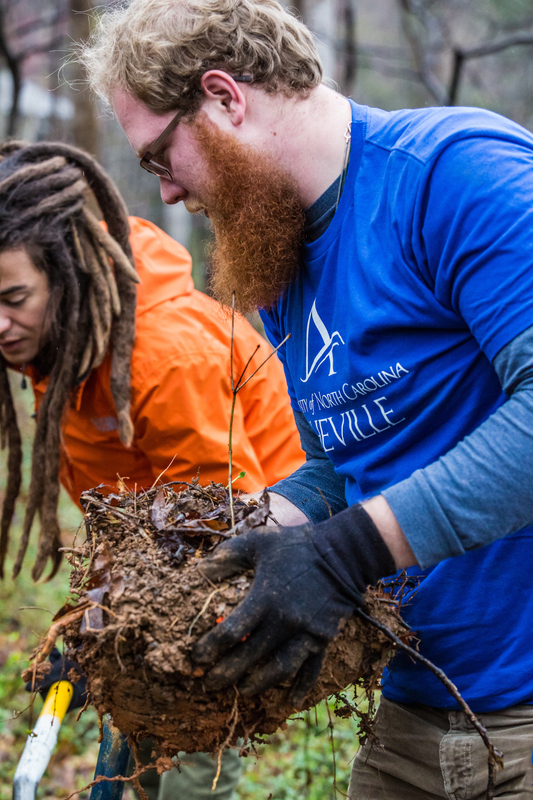 The Commencement Sapling Project is one more branch of UNC Asheville’s sustainability commitment—a commitment stated in the university’s Strategic Plan as a core value of UNC Asheville. The specific tree species Johnson has been collecting for this year’s Commencement reflect UNC Asheville values as well. “This year we’re going to be offering white oaks and red maples,” Johnson said. “I’ve been doing some research on what those trees mean and the significance, and looking back even to Nordic mythology and old Pagan traditions. Strength, leadership, and adaptability—the perfect trees to represent UNC Asheville graduates. Current students don’t have to wait until Commencement to get involved with the sapling project. From noon to 2 p.m. on April 12, 2019, Johnson will host a special red oak acorn planting event on the steps of Ramsey Library. Students will be planting the acorns—which were collected by students last semester—in containers, where they will be nurtured until they are ready to go home with next year’s graduates. For his own part, Johnson is excited to take home his UNC Asheville sapling after he graduates this spring. For more information about Honor Your Roots: The Commencement Sapling Project, visit unca.edu/saplings.